This entry was posted in Opiate, Success Story on December 2, 2012 by ATMC Team. I believe that neurotoxin removal is the most successful way of getting rid of those toxins and cravings, and I’m so grateful for having come to ATMC. 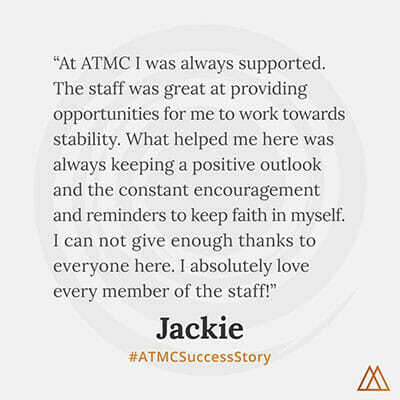 I was very happy to be here when I first arrived at ATMC. I had been off of Oxycontin for about a week when I first got here, and did feel better but really drained. I couldn’t wait to begin the program for neurotoxin removal because I wanted to start feeling better. After the first couple days of treatment I began noticing a change in the level of energy that I had, and was now capable of doing more activities, such as running at a faster pace everyday on the elliptical running machine. I was able to run longer and faster, without getting tired, and actually had even more energy when finishing a run than I did before I started. I felt drained and sleepy but after time, I had more and more energy when the day was over, and was able to go to class, go on a hike, shower, etc. and not feel tired! I really loved where my level of energy was at and also how I was sleeping plenty every night and how healthy I was feeling and the healthy foods I was eating. A dramatic difference could be noticed in every part of me after one week of doing the program, especially when I was able to realize what re-stims were, and that re-stims could be past drug use memories. The entire first week of opiate medication detox I had flashbacks every single day, all throughout the day, and could not stop thinking of doing drugs. On the 9th day, my mind had been clear of thinking about drugs at least for a few days. This was actually working, and to my surprise, although I even tried to remember past drug use, I couldn’t. It seems as though the memories were tremendously dulled out, and had lost and value to me anyway. This feeling was amazing, I felt freed from all of the negative thoughts, and felt much lighter, as though a huge weight had been lifted from me that I could finally be free from! I felt stronger and clearer minded than I ever had! Now that my head is clear, I’m able to think for myself, and have all of my strength and energy back, I honestly feel like an entirely new person. I’ve been feeling like I’m a kid again, which were the best memories of the life I had before I started doing drugs. I am so grateful for a second chance that I’ve been given to enjoy the prosperous, happy life that my boyfriend and I have always dreaming of having. I feel much more open-minded and don’t have any negative thoughts going through my mind. The neurotoxin removal process really rejuvenated and restored my mind, body, and spirit. Every day, I have been laughing and so happy all day. I not only feel 100% better, I had a great time doing this! I don’t have any memories of drugs and don’t want to, as I have replaced those memories and thoughts with ones of my positive goals for the future and my new outlook on living a healthy life. I just wish that every addict could go this program because I’ve watched people come in and out from 5 day detox, 28 day rehab, or 12 step programs and they just relapse which is sad since they are unaware that all of those toxins are even inside of their bodies. Now when my boyfriend and I go home, we have the strength, the will and, the mind power that we need to just say “NO” to using drugs and to feel really good about it too. We finally will be able to begin our life together, clear minded and clean so we will be able to make the right choices. One day we desire to have children of our own and to teach this healthy, happy way of life to them too so they won’t ever go through the heartache of drug addictions like we have. I have definitely learned so much being here and will definitely take all the knowledge I’ve learned back home and try to helps others learn how they can live a positive, happy life and re-assure them that they do not need “happy pills” in order to feel good; this can naturally happen. All I can really say is just how grateful I really am that I was given this second shot at life and thank you for all of the support which my boyfriend and I have received from the staff at ATMC and our wonderful families!